On this Easter weekend, I wanted to show off an old family tradition I recently re-discovered when scanning old family photos. 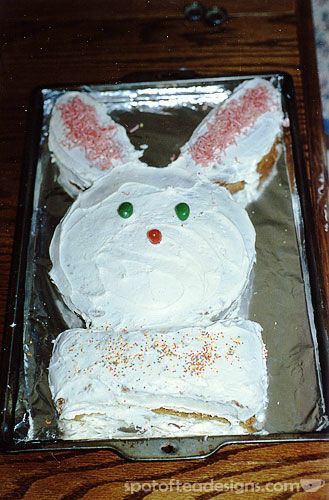 This photo was from 1988 and beautifully shows off my mom’s decorating skills for her bunny cakes. They were made from 2 round cake pan, decorated with some simple accents to recreate a bunny design. I’ve seen it pinned a lot on Pinterest lately but my mom’s been doing it since the 80s! As my sister’s birthday was early April, and often around the Easter holiday, she sometimes received one of these bunny shaped cakes to celebrate her big day! Happy Easter a few days early!